Mr. and Mrs. King have been married for 50 years! Mrs. King started dialysis in 2011 and opted for home hemodialysis (HHD) after peritoneal dialysis was no longer an option. Always by her side, Mr. King learned about the benefits of HHD and participated in the training sessions. He now handles every detail of the treatment himself and is a loving and dedicated caregiver. 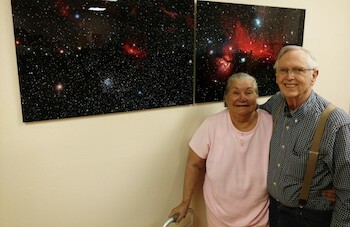 In his spare time, Mr. King combines a love of photography with his interest in astronomy. Some of his pieces have even been displayed publicly in his hometown of Santa Cruz, California. He recently brought in some of his work to share with his healthcare team at Satellite WellBound Santa Cruz. HHD has been a perfect match for the Kings. They like that treatments happen in the comfort of their home. Plus, home treatments give them the flexibility to spend more time with their daughter, two sons, and five grandchildren.